We are currently preparing for the launch of ‘Fossil Free Coventry'(FFC). The Fossil Free Coventry team continued to grow at our meeting last Wednesday. We will be launching the group during Green Week from 4th – 10th March. 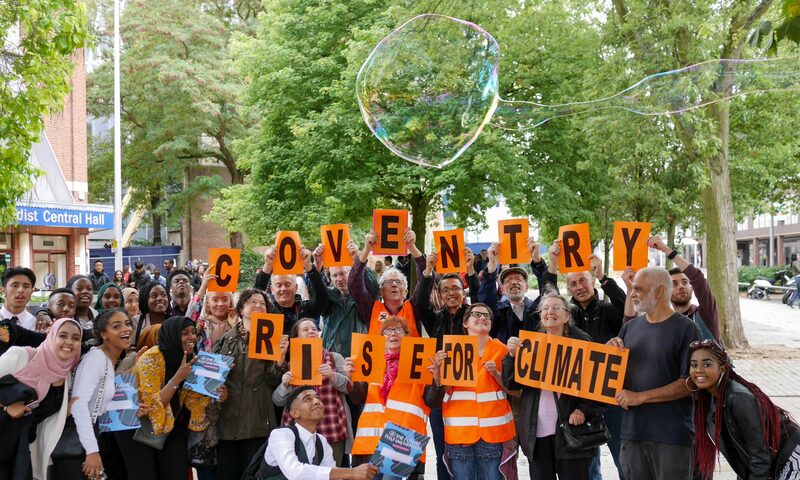 Fossil Free Coventry will collaborate with Divest WMPF to secure a commitment from Coventry City Council to push the pension fund to divest from fossil fuels whilst also working to speed up movement towards a fossil free Coventry. We will be keeping you up to date on developments via this blog and on the Divest WMPF Facebook page and the forthcoming Fossil Free Coventry Facebook page, alternatively contact us via the form below if you want to become more involved. We hope that 2019 will see the development of similar sister groups across the West Midlands. 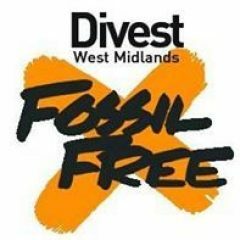 Together we can make divestment happen and work to make the West Midlands ‘fossil free’. I thought it would be worth reviewing what we’ve achieved this year in our campaigning for the West Midlands local government pension fund (WMPF) to divest from fossil fuels. 2018 kicked off with fantastic news of £500 funding for the campaign from Edge Fund organised by Alex. Tim attended a public health and climate change conference and made several valuable contacts. Until joining the campaign, I had never considered the effects of climate change on public health, but it is actually considered to be one of the major risks in the coming years. Throughout the year, the team has been busy holding meetings and spreading the word via exhibiting at and attending events, including at Birmingham City University and a multi-faith stall. In March, Kay attended a UNISON meeting and was due to present a motion for divestment, but unfortunately there were insufficient attendees. In 2019, I hope that we can get the local union branches on board as key supporters of the divestment campaign. Also in March we were invited to speak to the Kings Heath All Saints Church Justice Peace and Green Group. They were really interested in the campaign, and reminded me of how much action church groups are taking. One of my personal objectives for 2019 is to spread awareness of climate justice within churches in Birmingham. In December I joined in a personal capacity a protest at the BBC in Birmingham organised by Extinction Rebellion and Christian Climate Action, some of whose members have been arrested for direct action this year. In April we started to prepare for the council elections in May. Elections provide a fantastic listening opportunity for the candidates, so we sent out pledges calling for the candidates to support fossil fuel divestment. The response was pretty positive. Many individual candidates from different parties signed up, as well as whole party groups like the Liberal Democrats. We published a complete list of candidates here. In other news from the international divestment movement, we heard in July that Ireland had decided to divest from fossil fuels. This was to be followed by hundreds of further announcements around the globe until in December, the 1000th institution pledged to pull out of fossil fuel investments. The current total today stands at nearly $8 trillion. This is enormously important because it demonstrates to institutional investors that it is no longer acceptable or prudent to profit from catastrophic climate change. The summer heatwave brought climate change to the attention of many people, together with a significant report warning of a hothouse earth if tipping points are crossed. This prompted us to send out an email to councillors across the region calling on them to take urgent action to divest. This call was picked up by the leader of the Conservative group in Coventry City Council, Cllr Gary Ridley who asked a question in the council meeting. To follow up from this we decided to produce a report in which we found that the fossil fuel companies which WMPF invests in are not serious about action on climate change, demonstrated by their tiny (3%) investment in renewables. We had some fantastic support from Labour Councillor Cllr Bally Singh and we hope that we will soon be able to get cross party support for a council motion. In October the United Nations IPCC released a bombshell report warning us that we only have 12 years to take drastic action to limit the most catastrophic effects of climate breakdown. For many people and governments, this was a wake up call. No longer can we continue with business as usual. But for those who follow climate change in the news, many of us felt a sense of hopeless despair that the dire warnings of scientists are not being heeded by governments. Currently the planet is on a trajectory towards over 3C taking us over expected tipping points and an uncertain future for us and our children. With millions around the world set be affected by rising sea levels, droughts and extreme weather, how can it be that even our local government continues to fund fossil fuel polluters? The answer is that it is time for people to take the future of the planet into their own hands. We shifted our campaign focus to Coventry starting with a showing of the fracking film Power Trip. We found hope in the terrific response to the Rise for Climate action in September. And this was followed up with two meetings attended by many new members. There is passion for change in Coventry, and we are trying to keep the momentum up as we hold another open meeting in January which we encourage anyone interested to attend (sign up here). Our aim is to spin off a new campaign group, launching with actions in March. Watch this space – or join us! In London yesterday, protesters from Extinction Rebellion closed five bridges. This was an act of desperation, but when government and the media continues to ignore the scale of the climate crisis, and will not listen to the scientists, desperate measures are called for. In a series of tweets, George Monbiot spells out the crux of the crisis, and why the possibility of extinction of our species needs to be taken seriously. 1.5C is an arbitrary figure. There is no guarantee that this is a “safe” level of global heating, below the threshold between one climatic state and another. It could be 1.383C. Or 1.649C. Because these are highly complex systems, we have no idea where the tipping point lies. The transition, when it comes, is likely to be abrupt and drastic – this is what has happened in the past. Complex systems seek equilibirum. When they are knocked out of one stable state, they flip into another, often entirely different state. The different state could be inimical to human life, and many of the other lifeforms with which we share the planet, which, like us, have evolved to survive the current climate. The ony honest answer is that we have *no idea* of where the threshold lies. We cannot compute the full range of feedbacks between atmosphere, oceans, terrestrial carbon sinks and biotic responses. All we can say is that any gradual increment in temperature rise could be the last, before sudden, cascading #ClimateBreakdown occurs. So what does this mean for policy? In other words, to allow the systemic healing mechanisms, that maintain the current climatic equilibrium, to kick in. The overwhelming priority for human welfare is a Marshall-scale plan for the planet. But no government is yet committed to this. This is why the work of @ExtinctionR and other rebels against inaction is crucial. Society is like an amoeba: it moves from the margins, not from the centre. Government will not lead this change. But we can. Part of our response has to be to stop funding the companies which are doing so much to block government action, which are extracting the carbon and funding their toxic business models. We urgently need to take our pension money out of big oil and put it into the new economy. A new report from Friends of the Earth comparing climate risk performance of local government pension funds has found that West Midlands Pension Fund (WMPF) is inadequately preparing for financial risks associated with climate breakdown. The report places WMPF in the second lowest category of funds – those that acknowledge the risk of climate breakdown but have taken inadequate action. These funds are taking some action, but these are heavily reliant on unclear or ineffective engagement strategies. These funds need to expand out of their overly narrow focus on engagement, and also ensure that engagement activities have clear goals and deadlines. These funds’ failure to address climate risks adequately puts them at serious risk of breaching their fiduciary duty. Last month the Intergovernmental Panel on Climate Change issued its latest report warning that the planet is expected to reach 1.5 degrees within as little as 12 years. One billion people will regularly endure conditions of extreme heat. Sea levels will rise exposing up to 69 million people to flooding. Up to 90 percent of coral reefs will die. Fishery catches will decline by 1.5 million tons. 1.5 degrees is ‘ridiculously aspirational‘. As the planet warms, a domino effect of feedback loops risk pushing the temperature much higher, as much as 4 – 5 degrees. Extreme and urgent actions are required. Notwithstanding that the world into which pensioners retire will be significantly affected by climate breakdown, local government pension funds are challenged with serious financial risks. To avoid the more catastrophic effects of climate breakdown, much of the proved reserves of the fossil fuel industry will have to remain in the ground. Despite assurances to shareholders, the fossil fuel industry is putting the brake on meaningful action from policymakers by pouring millions into lobbying efforts, notably in the US midterms where unprecedented political spending helped it to defeat several green policies. Shareholder engagement is not successful at changing the core business model of companies, so it is time for local government pension funds to completely divest from fossil fuels. West Midland Pension Fund administrators have ignored the call from Birmingham City Council to divest. The remaining member regions including Coventry City Council now need add their voice and force WMPF to protect their stakeholders and divest from fossil fuels. Not doing so is to ignore what the UN chief calls the ‘direct existential threat‘ of climate breakdown.